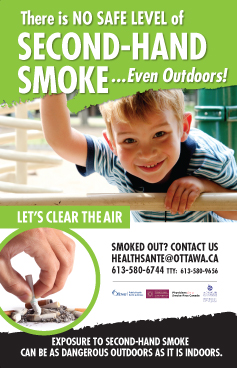 Thank you for supporting the smoke-free outdoor spaces campaign! The City of Ottawa adopted the smoke-free outdoor bylaw on February 22, 2012. As of April 2, 2012, restaurant and bar patios, parks, beaches, sports fields; and festivals and events on municipal property are 100% smoke-free. Second-hand smoke contains more than 7,000 chemicals, of which 69 are known to cause cancer. On a restaurant patio, near a doorway where smokers are congregating, or at a packed outdoor concert, exposure to second-hand smoke outdoors can be as dangerous as it is indoors. At the beach or in the park, even if only one or two people are smoking within about 7 metres (23 feet), it can still be harmful, especially to people with heart disease, cancer, asthma, Chronic Obstructive Pulmonary Disease (COPD) and other breathing problems, as well as to children and the elderly.